Travelling supporters go wild as they overturn early lead for Thierry Henry's side. 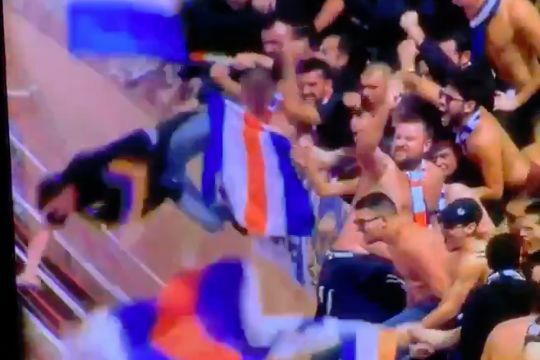 A Montpellier fan fell out of the stand where the away fans were located as they celebrated a late equaliser in a 2-1 win at Monaco on Saturday. Thierry Henry saw his side’s first-half lead overturned as they conceded twice in the last ten minutes of the Ligue 1 clash. Gaëtan Laborde’s 81st-minute strike was greeted with wild celebrations by the visiting supporters who had made the 700km round trip to the Stade Louis II. In the midst of the melee, one supporter could be seen on the television coverage falling a short distance from the away end to the floor. Montpellier went on to score again and win the match just five minutes later. The result leaves them in 2nd place while Monaco languish in the relegation zone, second from bottom with just 10 points from 15 games.